Gibbings, Alison and Vasile, Massimiliano and Watson, Ian A. and Hopkins, John-Mark and Burns, David (2012) Laser ablation for the effective deflection, exploration and exploitation of asteroids. In: Astrobiology Science Conference 2012, 2012-04-16 - 2012-04-20. Any asteroid-to-Earth impacting event could result in the wide spread, a mass extinction of life. 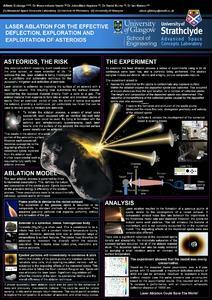 To address this risk, laster ablation is being investigated as a justifiable and achievable technique for the successful mitigation and deflection of asteroids.